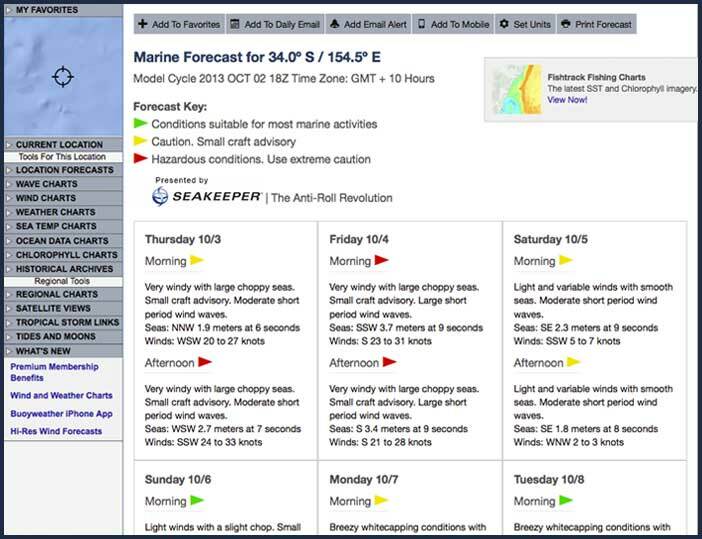 By viewing the tutorial video below, you'll learn how to receive a 7-day forecast for any offshore location and learn how to add this forecast page to your favorites for easy access the next time you log-on to Buoyweather.com. It looks like you don't have the latest version of the Flash plugin installed. Below you can have a second look at the steps covered in the tutorial video. Instead of trying to find information for a location, we've reversed the concept. You pick your location(s) and we generate the information for that exact spot! 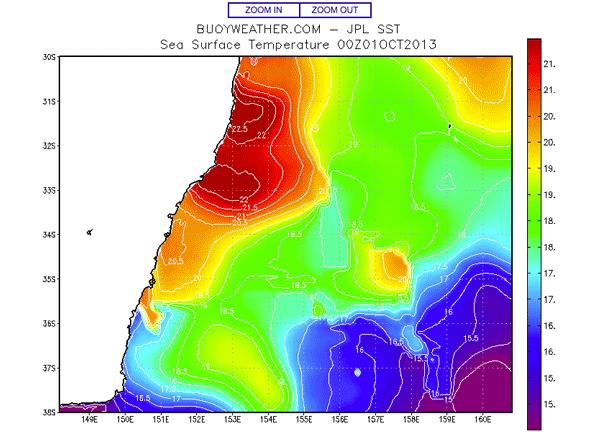 Try it and you'll realize why Buoyweather is the most capable and easy to use marine forecasting system in the world. First, login at the top of the page with your premium username and password. If you are a free user then just continue without logging in. 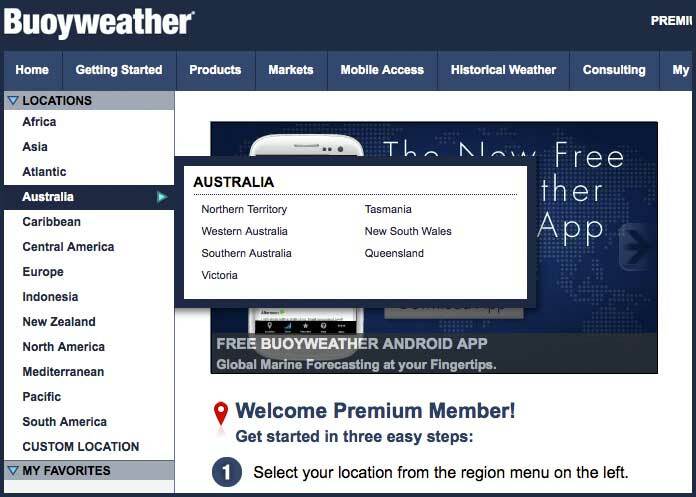 Starting with the geographic menus at the left of the page pick a location in the region where you're interested in receiving a forecast. The map is the heart of the Buoyweather engine. 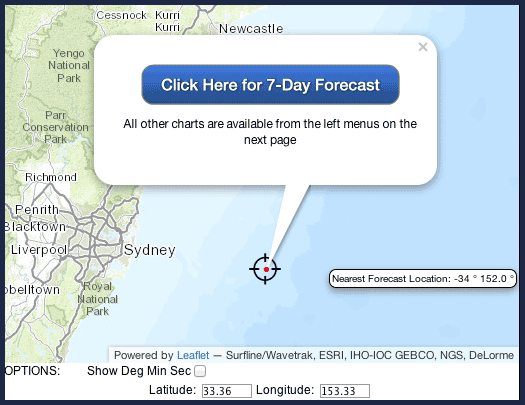 Use the map to drill down to the exact location you're interested in (in this case - offshore of Sydney, Australia) - the map shows you the location of the nearest available forecast point. (Note the orange target). Premium members, click on "DETAILED 7-DAY MARINE FORECAST" and you will receive a 7-day wind and wind swell forecast for this location. Non-premium users will receive a 2-day wind and swell forecast. In the left hand menu you will see many more charts and forecasts centered on the Lat/Lon point you have chosen. 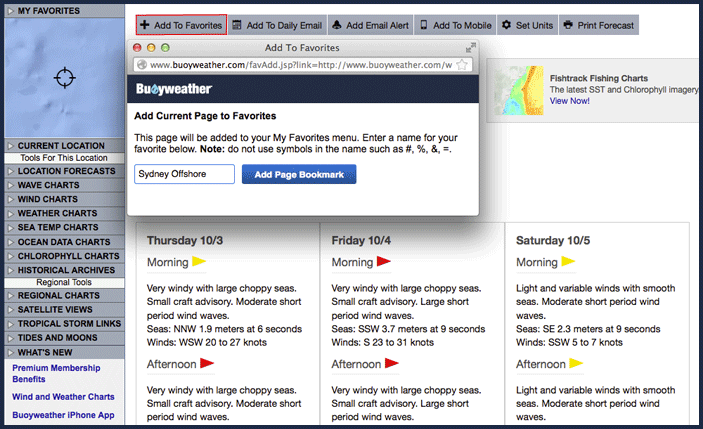 In order to avoid repeating steps 1-3 every time you visit Buoyweather, click on the "+ Add To Favorites" Icon at the top left of the page and name this forecast point for easy future reference. Now every time you come back to Buoyweather, you will have immediate access to this "Favorite" by clicking the link in the left hand menu. Your favorites will be listed in the left hand menu of the home page and every other forecast page from now on. Everything you see on the expandable menus on the left is now based on your specific location and you can add as many "Favorites" as you want. For example, if you click on the link for "Sea Temp" then click on "JPL 1K" you receive a high resolution regional Sea Surface Temperature chart for the region offshore of Sydney! Now take a look through the menu items and you will see all the other interesting products we offer, and to try them all out, Start a 15 day FREE Premium Trial Now!